Thomas is taking a break now, but here is the most recent status of the grisaille under-paintng. This looks great! I can’t wait to try this for real. I have painted grissaile paintings, but never worked back over them with color. That’s something I have always wanted to try. Will you varnish it in between? The cloth over the bench is especially appealing. I am really curious about the adjustments to be made after you paint in the figures. Like, what parts of the background will be heightened and what will be diminished in value to highlight key figures? Thanks, Mikey. I’m curious too. I am sure there will be more than a few adjustments along the way. I’ll do a light layer with diluted cut of varnish when it is time to start glazing with color. 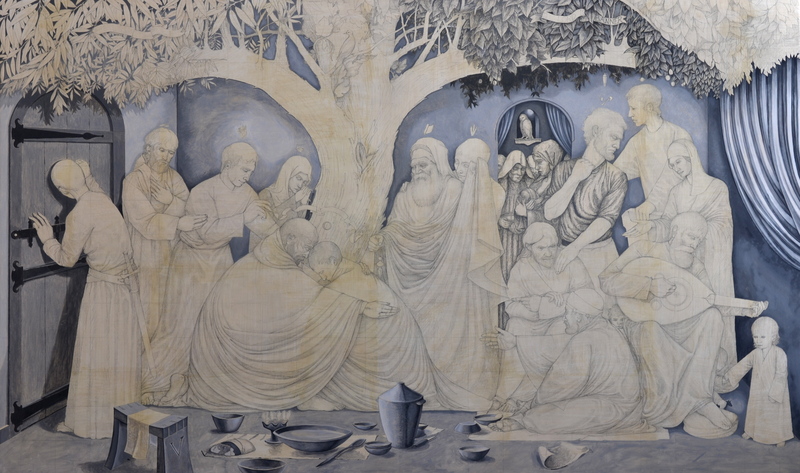 I can’t wait to see the grisaille come to life. This painting is going to be so intense! I love the owl sitting quietly back there in a mysterious, curtained world. Another curtain. Really strong design with all those curving verticals. Is the owl connected to the women in the inner, or outer, chamber? There really is a lot of mystery and action taking place. I concur. I hadn’t even seen the owl until you mentioned it, Stephen. That’s a great moment back there with him sitting in the window, Jack.